Why Should I Insure My Engagement Ring? The cost of coverage depends on the value of the piece, where you live, and the deductible (the amount you'll pay to replace the ring before the insurer) you select. 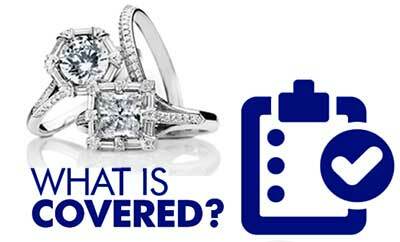 Find out if your existing insurance policy covers an engagement ring. While insurance policies held by renters and homeowners set limits for loss of certain categories of personal property, including jewelry, you may be able to add a personal articles rider or floater. 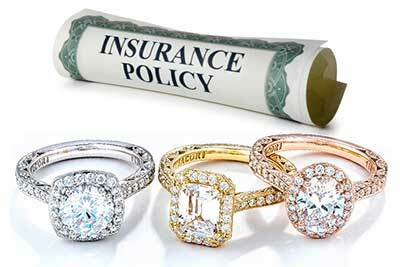 Contact jewelry insurance representatives for the best rate. Jewelry insurance companies have more comprehensive coverage than standard homeowner’s policies, allowing the recreation of a lost piece or repair of a damaged one. They also offer the most options. An appraisal (a document that validates how much the ring is worth) is required for items with a value of $50,000 and above; recommended for others. Coverage does not apply to loose diamonds. Jewelers Mutual is a personal jewelry insurer covering repair and replacement of engagement rings. Policies are not available for unset stones, damaged items or antique jewelry. The company requires an appraisal for coverage. They have online quotes available here. Another insurance company we are familiar with is GemShield. You can request a quote from them here. Are you insured for loss? Theft? Fire? Accident? Mysterious disappearance? A diamond with a Gemological Institute of America [GIA] grading report can help you track down the stone in case of robbery. How will a lost or stolen item be replaced? Will the insurer issue a check? Are you bound by their choice(s) of jeweler for the replacement? Will you receive full cost or a fraction? We recommend a policy that covers full value. What kind of proof will you need to file a claim? Are there any non-covered situations? Does the policy cover the ring while you are traveling? This documentation is particularly important if you purchase an antique or vintage ring, or have a custom designed piece created. You should have your engagement ring reappraised every two to three years to keep the ring insured for the proper amount. An appraisal also provides a "fingerprint" for the owner to legally claim a ring that may have been stolen and recovered by the police. It's also a must to sell the piece in the future.